Yogi Chelsea is a spiritual being having a physical experience. She’s a yoga teacher, Mindfulness Mentor, and Kidding Around Yoga trainer. Born and raised in Erie County, Pennsylvania, she’s raising her two children (and two cats) with their father in Lake City, Pennsylvania. She strives to bring the especially relevant benefits of yoga into students of all ages, whether they be four, or one hundred and four! Yogi Chelsea enjoys bringing mindfulness to the students at her children’s school in addition to working with local families. She also works with yogis who have more life experience at Pennbriar Athletic Club. She helps new yoga students at Plasha Yoga to develop a love of Integral Yoga. Most noteworthy, these are the same practices that have served her for the last 10 years. After receiving her 200-hour certification from Plasha Yoga Studio in 2013, Yogi Chelsea went on to complete their 300-hour certification. Consequently, she is currently an E-RYT 200, RYT 500, and YACEP. She has also experienced continuing education in meditation, pranayama, anatomy, and children’s yoga. Some of her teachers include Leslie Kaminoff, Haris Lender, Rudra Swartz, Michael Plasha, and Chris McCooey. 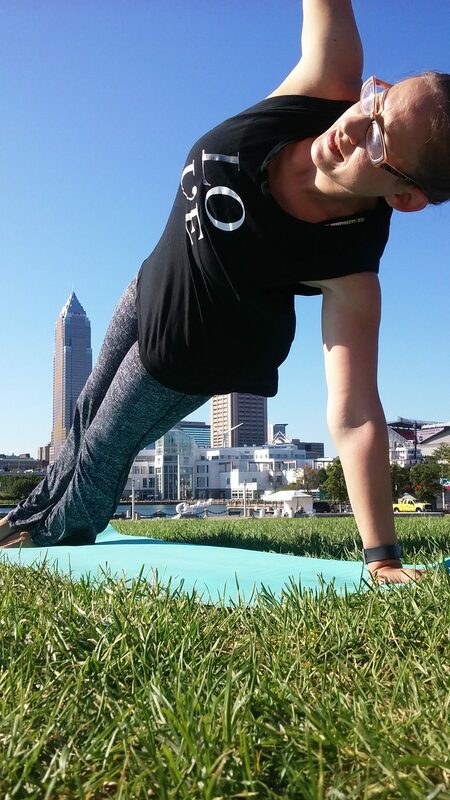 Yogi Chelsea loves that the eight limbs of yoga can be applied to ANY yogi’s life and she’s inspired by the progress she’s seen in all of her students. You can read about Yogi Chelsea’s personal yogic journey here.